The Graveyard project was started in 2008 by the Langtree History Group in response to the fact that the church records for the graveyard had been lost or destroyed. Mike Roe offered to carry out a survey of the graveyard with the objective of producing a new set of plans for the Parochial Church Council plus a copy for the history group’s archives. In addition to this exercise, it was decided to record as much information as possible about the graves by recording the inscriptions on the various memorials and to build a database of the information for future reference and research. The two exercises were carried out simultaneously with help from various members of the History Group. All graves have been photographed and their inscriptions recorded wherever possible. Their positions have been recorded for the new graveyard plans. In order to make surveying as easy, accurate, and as simple as possible a map scale had to be determined to fit the most convenient paper size available; in this case A2. The scale chosen, with this in mind, was 1:100 or 1cm on the plan equalling 1m on the ground. The graveyard was divided into 6 clearly identifiable sections and each given an identifying letter. Within each section the graves were numbered. For computer use a three figure number with a letter prefix has been used eg A005. 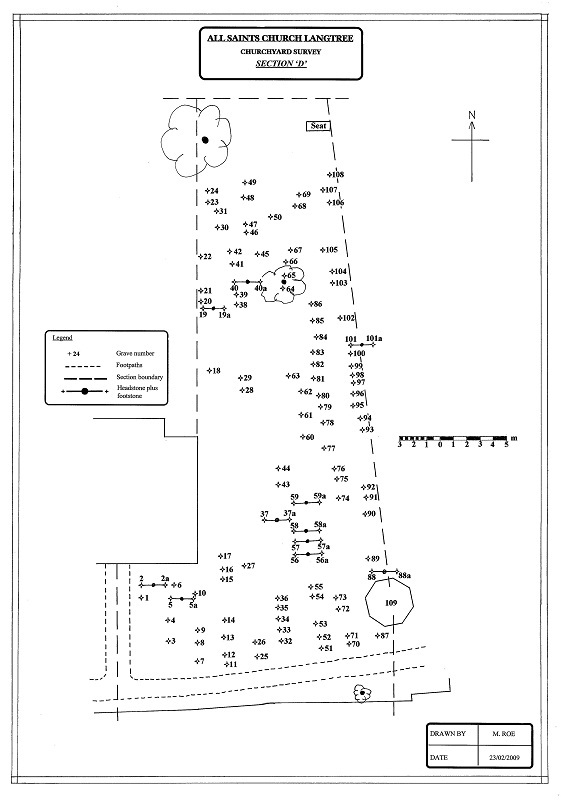 A very basic survey, using the tape and compass method, was used to determine the position of each grave. Wherever possible a reference line, in the form of a long tape measure, was related to the church itself which is aligned in an accurate East – West position. This was checked with an accurate compass with adjustments made for the position of Magnetic North. For the northern sections of the graveyard (Sections C and E) an accurate east – west baseline was laid down, again with a long tape, and further measurements taken from that datum. From each of the main datum lines created, offset lines at 90 degrees to the datum were laid down using a second long tape measure. The right angle was laid out using the 3, 4, 5 triangle method or by accurate compass readings which were checked by back bearings from the far end of the line. The offset lines were positioned in such a way that the maximum number of graves could be recorded from each line. Working along the offset lines, the position of adjacent graves, on either side of the line, were recorded using a tape and measuring to the nearest 5cms. Measurements were made to the centre of each headstone. Where a grave had a body stone, it’s dimensions were recorded. There are a number of unmarked graves within the graveyard. Where these have been easy to identify their position has been recorded and a reference number assigned. Where there has been any doubt whether a bump in the ground is an unmarked grave, or not, the feature has been ignored and no records made. Other memorials such as seats have been noted on the spreadsheets and photographs and have been included as part of the overall picture. During the survey process the photographs were taken. Once the data for a section had been recorded the information was transferred to paper which when completed was checked, on site, to ensure accuracy. Any errors were corrected before a fair copy of each drawing was transferred to tracing paper in readiness for final printing. The database holds Names, gender, age at, and date of death, and the origin of the deceased form the main data fields. There are gaps in this information where it was not possible to read the stones or where this data was not recorded on the stones. Inscriptions and verses were also recorded but in some cases, due to the condition of the stones, this was difficult, or impossible. Notes of the type of stone and the mason are recorded and a scoring system of 1 - 5 was devised to reflect the condition of the stone with 1 being almost mint condition to 5 being unreadable. In addition to the section spreadsheets an alphabetical index has been created listing, by surname, of all the deceased within the graveyard. There are approximately 20 graves and memorials within the church itself. These will be recorded as soon as possible to provide a complete record for the church. The format will be the same as for the graveyard and this information will be available in due course. Hard Copies The spreadsheets, and photograph collections have been bound into a series of booklets. These are also available in electronic form on two CDs. The final plans are also be available in digital formats. All of the plans are in a variety of digital formats. The photographs are in JPEG format which can be used on the majority of modern computers. Please note that extensive checks have been carried out on the data and we believe that, at the time of completion of this project, all data is accurate. Mistakes will have a habit of appearing, unnoticed by the checkers. Should anyone find any major errors then please let the Langtree History Group know so that the necessary corrections can be made and amendments issued to known recipients of the material. There is no copyright on the whole of this project. This will allow anyone to make copies of the plans and data. It is expected that this information is not placed for sale in any way. The majority of the surveying and computer work has been carried out by Mike Roe and he is happy to provide technical backup or advice to anyone who wishes to use the data or would like to carry out their own survey work elsewhere. The original data, plans and photographs are held both on paper, and in digital format, by the Langtree History Group members Margaret Knapman, Mike Roe and Andy Roe. Copies have been presented to the Parochial Church Council for their records. Further copies of any of the information are available from Mike Roe but please note that a charge of £10 will be made for a full set of paper plans plus computer disks, £2 per computer disk, and £4 per paper set only. This is just to cover production costs. Mr Andy Fox of Berry Cross for organising the printing of the plans through his company. Mr Short, Monumental Mason in Holsworthy for information on the various types of stone that have been, or are currently in use for the production of headstones. Susannah Roye, student from Barnstaple College, for helping out with a little of the surveying work. Section A is located in the south-west corner of the church yard and comprises a total of 35 graves or memorials. The ages of the memorials range from the earliest, in 1772, to cremation memorials of 2005. Most of the stones are in good condition where made of good quality slate but some of the older slate and sandstone memorials have suffered erosion over the years. A005	- This stone has inscriptions on both sides, each side being in remembrance of a separate family. The eastern face is badly eroded but the western face is still readable and it is probably the correct inscription for that grave. A009	- This memorial comprises two small horizontal stones laid side by side. The inscriptions show initials and dates only. For the records, this has been treated as one grave. A012 - This grave dominates this section and is a memorial to 5 members of the Mills family. A024 – The grave of Catherine Nethaway is the oldest grave in this section. Note that date of burial, rather than date of death is recorded. A026 – This memorial to the members of the Davie family is attached to the church wall and is formed from two large slates. The location of the grave is uncertain. 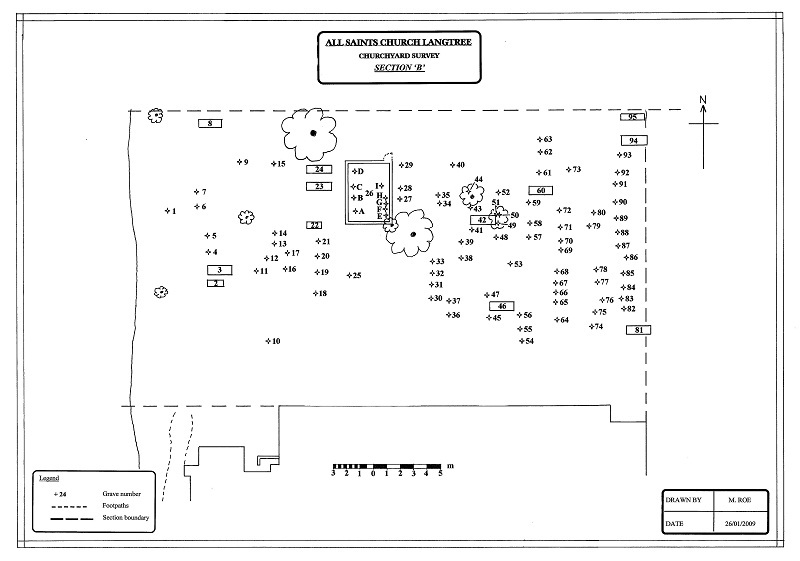 Section B is located immediately to the north of the church and comprises a total of 102 graves or memorials. Most prominent is the fenced family grave of the Guard family which contains 7 separate graves, two with footstones. For recording purposes this has been designated as one grave (B026). Each stone has been given it’s own identifying suffix letter. The quality of the stones, in this section, varies between old and very clear, to very old and virtually unreadable. There are a few relatively new stones. Some of the stones made of poor quality stone are showing signs of degradation due to weathering. Small trees have been allowed to grow around some of the stones which has made evaluation and photography difficult. B026	- The large family grave of the Guard family as mentioned above. B009	- The grave of Emma Grace and Charley Ford who died on the same day. B090 - This grave of John Tucker who was sadly killed by a falling tree. B046, B081 and B095 – All these graves have coffin shaped body stones. 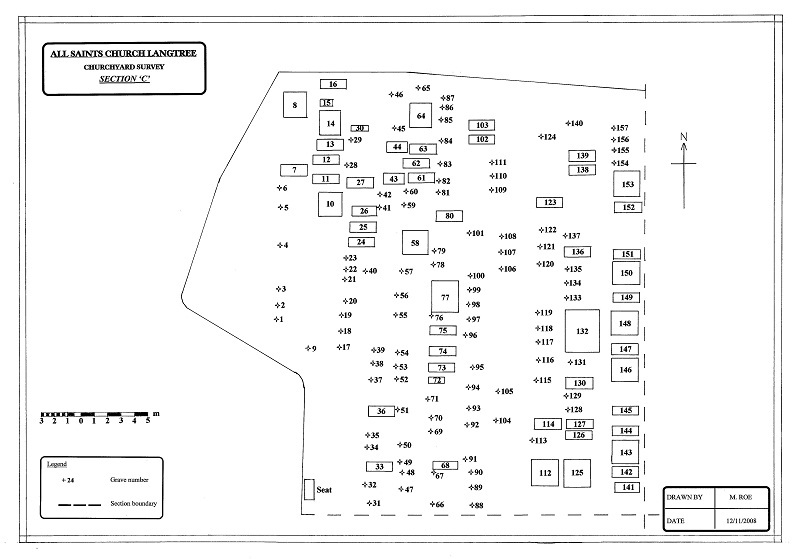 Section C is located in the north-west corner of the graveyard and comprises a total of 158 graves or memorials. Most of the memorials, made of good quality stone, are in good condition and inscriptions generally easy to read. C077	- A very large grave with two separate headstones. C104	- This grave consists of three separate stones; one facing west and standing. The second backs onto the first with a third propped against the second stone. C132 – Another massive family grave with two separate headstones. Also scattered across this section are a number of unmarked graves. Those that have been easy to identify as graves have been assigned a reference number. A number of child graves are found in this section. Some are unmarked but have been identified by their small size. A newly erected seat has also been included in the list of memorials but has not been assigned an identifying number. 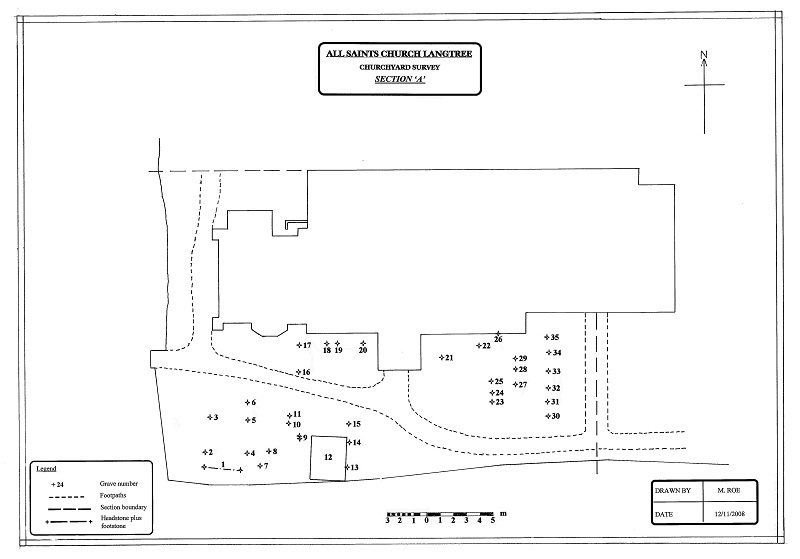 Section D is located immediately to the east of the church and comprises a total of 108 graves or memorials. This area has some of the oldest graves in the churchyard. Those of poor quality stone have degraded with time but the Delabole slate stones are almost as fresh now as when erected. There are no graves of particular note in this section. Several of the old graves have quite large footstones with quotes and verses inscribed. These have been recorded and the footstones carry a reference number the same as the grave to which they belong but with an ‘a’ added as a suffix. Also of note is the style of lettering used on some stones being very austere and Germanic in nature. A seat, and the base of the cross also feature in this section. Both have been noted in the spreadsheet. The base of the cross has been given an identifying reference number. A line between these two features forms the eastern boundary of this section. 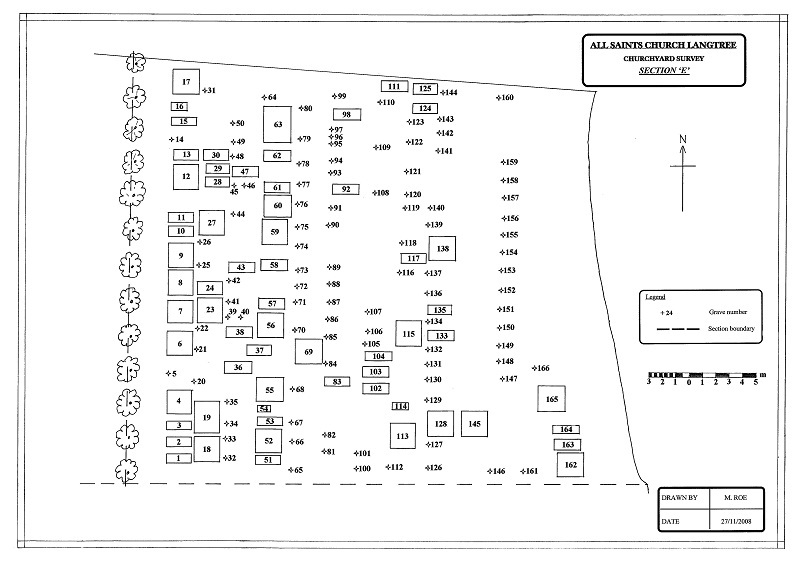 Section E is located in the north-eastern corner of the graveyard and comprises a total of 165 graves or memorials. The ages of the memorials range from, the earliest around 1890, to recent memorials of 2006. There is a wide range of gravestone designs and materials used within this section. Most of the memorials are in good condition but some of the older stones have degraded. In some cases mosses and lichen have obscured the inscriptions. E079	- The grave of William Best Oliver who died at Stibb Cross but appears to have been resident in Polperro, Cornwall. E150 – The grave of Richard Bond who died at the age of 99 years and is the oldest recorded person in the graveyard. E145	- This grave is in memorial of the vicar of Langtree, and his wife, who were in post for much of the early part of the 20th century. 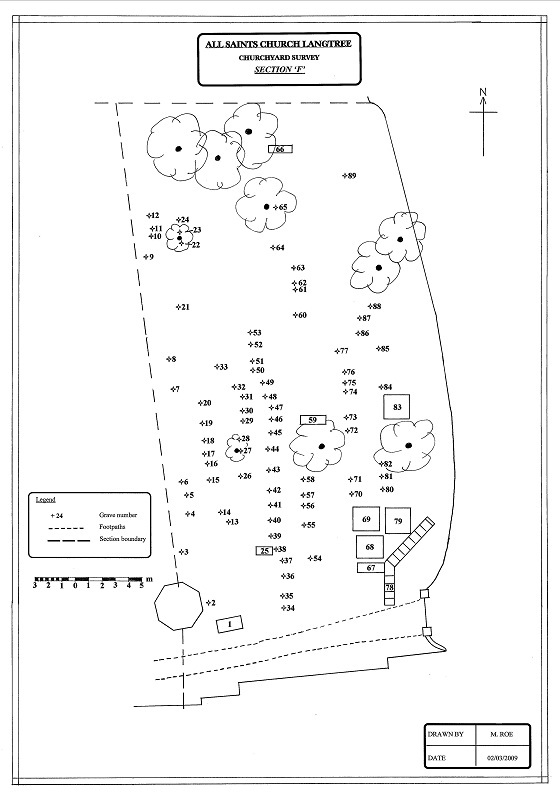 Section F is located in the south-eastern corner of the graveyard and comprises a total of 89 graves or memorials. Most of the stones are very old although many are in remarkably good condition. A few, however, have suffered damage and have become unreadable. One has fallen and a large adjacent stone has snapped leaving a large stump in situ. There is evidence on this stone that an attempt had been made to rejoin the two parts. F027 and F028 - The surnames on these two stones are Jolla and Joller respectively. If these are relatives then which stone carries the correct spelling? F040 – Carries a very unusual Christian name – Peternell. F078	- is the memorial to Richard Archer Wallington, rector of Langtree for some time. The memorial is formed in the lower three steps of a flight of steps just inside the eastern gateway.